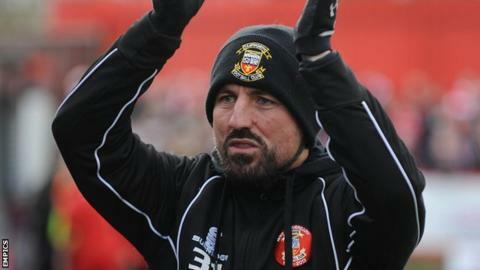 Tamworth manager Dale Belford is to remain in charge despite the club's relegation from the Conference Premier and will continue to lead the Lambs next season. The Tamworth board have opted to stick with Belford, 47, who has long been an integral part of the club. "I just feel that if you change direction every season, it can become a farce," said chairman Bob Andrews. "You see it at all levels. Teams change a manager and it doesn't always work." Since being promoted as Conference North champions under Gary Mills in 2008-09, Tamworth have never finished in the top half of the Conference Premier. The Burton-upon-Trent-born former Lambs goalkeeper, whose son Cameron now keeps goal for the club and whose father Buster is the club's kitman, took over, initially as caretaker boss, following Marcus Law's sacking in January 2013. Although he kept Tamworth up last term, this time they went down by 13 points, largely as a result of a disastrous run of eight defeats in nine matches at a crucial time of the season between March and April. But Andrews believes that, having had their five-year tenure in the Conference Premier broken, Belford is the man to take the Lambs back into the top flight of English non-league football. "I want some stability," added Andrews. "And I think Dale can bring that to us. He's a local person who understands non-league football and he needs to be given a chance. "He's passionate about Tamworth Football Club and has the club at heart and that's important for us right now." Tamworth assistant manager Scott Lindsey, who had been Belford's right-hand man for the past 16 months, has left the club to return back to his home in Kent.